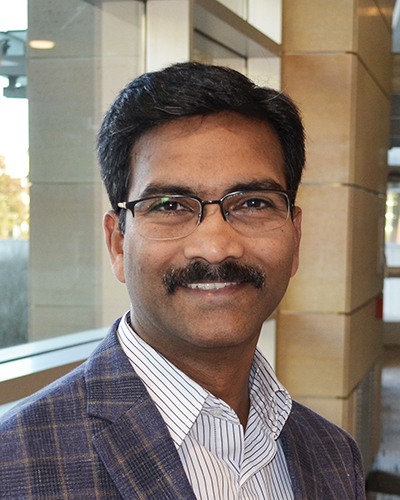 Babu Guda is the first Chief Bioinformatics and Research Computing Officer, as well as a Professor in the Department of Genetics, Cell Biology and Anatomy at UNMC. He is also the inaugural Director of the Bioinformatics and Systems Biology Core Facility, which supports bioinformatics research projects within Nebraska and the surrounding states. Dr. Guda has an interdisciplinary training background in genetics, molecular biology, computer science and computational biology with over two decades of experience in bioinformatics research. He earned his Bachelor’s and Master’s degrees from AP Agricultural University (India) in Agricultural Sciences and Genetics, respectively. He earned a Ph.D. in Molecular Biology from Auburn University in 1997, and worked at Iowa State University and University of California San Diego as a post-doctoral researcher, where he trained in Computer Science and Computational Biology. In 2004, he joined the Cancer Research Center at the State University of New York at Albany as an Assistant Professor, where he developed research programs in computational systems biology. He joined UNMC in 2010 as a tenured Associate Professor and the Director of Bioinformatics and Systems Biology Core. He has published over 70 peer-reviewed research articles that cover a wide range of topics related to Bioinformatics, Systems Biology and Next-Gen Sequencing Data Analysis, Cancer Genomics and Metagenomics. In 2014, he was named a Distinguished Scientist at UNMC and in 2015 he became the Chief Bioinformatics and Research Computing Officer. Dr. Guda is a prolific collaborator on a variety of research projects related to Biomedical Informatics. He is the Bioinformatics Core-Lead on the INBRE and Cancer Center Support grants, and also a Co-Investigator on several NIH grants that require significant bioinformatics support. He leads a productive research laboratory in Bioinformatics and Cancer Genomics areas that employs junior faculty, postdocs and graduate students. He is the Director of the Bioinformatics track in the Biomedical Informatics Graduate Program at UNMC. In addition, he actively serves on a number of NIH, NSF and DoD study sections and the organizing committees of International Conferences related to Biomedical Informatics.